Zion Market Research has published a new report titled “Intelligent and Cognitive Radio Market by Component (Antennas, RF Electronics, Wireless Cognitive Radio System, and Network Control and Management) and by Application (Public Sector,Mobile/Wireless Network Operators, and Other End-Users): Global Industry Perspective, Comprehensive Analysis, and Forecast, 2017—2024”. According to the report, the global intelligent and cognitive radio market was valued at USD3.15 billion in 2017 and is expected to reach approximately USD8.31 billion by 2024, growing at a CAGR of around 14.87% between2018and 2024. Intelligent and cognitive radios monitor, sense, and detect the conditions of their operating environment and vigorously reconfigure their own characteristics to best match to those conditions. Cognitive radio technology enables radio devices to use their spectrum in an entirely new and advanced way. Transmitting parameters, such as frequency, power output, and modulation, can be automatically adjusted in these radios to provide an optimized communication experience to the users. These radios use frequencies and find available bandwidth where other radios can see only static. The intelligent and cognitive radio market is showing remarkable growth and is expected to continue the same in the future. Cognitive radios support different types of technologies, such as self-organizing networks, dynamic spectrum access, and spectrum markets, which are helping in improving communication. 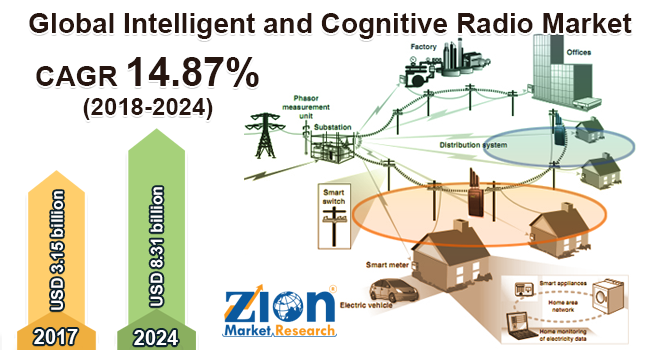 The growing need for better communication and optimum utilization of the available spectrum is likely to fuel the intelligent and cognitive radio market. Improvement in wireless communication, reduction in communication costs, the rapid increase in the number of wireless applications, and high interoperability are some other major drivers leading to the growth of the intelligent and cognitive radio market. Furthermore, the high adoption of cognitive radio technology by the defense industry and commercial market for public safety communications are also driving this market’s expansion. However, these radios have high manufacturing costs and reliability issues that might limit this market. The intelligent and cognitive radio market is divided on the basis of component and application. Antennas, RF electronics, wireless cognitive radio system, and network control and management comprise the component segment of the intelligent and cognitive radio market. By application, the intelligent and cognitive radio market is segmented into the public sector, mobile/wireless network operator, and other end-users. By region, the market for intelligent and cognitive radio is divided into Asia Pacific, Europe, North America, Latin America, and the Middle East and Africa. In terms of revenue, North America was the largest intelligent and cognitive radio market in 2017, followed by Europe.TheU.S. has one of the world’s largest and most advanced military. It is a major market for intelligent and cognitive radios. The high demand for these radios in military communication sector and public safety broadcast shaping the intelligent and cognitive market in this region. Asia Pacific is expected to grow at the highest CAGR during the analysis period, owing to the increasing demand due to advanced features, functionality, and greater precision of intelligent and cognitive radios. Latin America is also estimated to show noticeable growth in the intelligent and cognitive radio market in the future. Major players contributing in the market are Adaptix, Inc., BitWave Semiconductor,AeroStream Communications Corporation, Nova Engineering, AirNet Communications, Array Systems Computing, Altera Corporation,Mercury Computers Systems, Analog Devices, Cambridge Consultants, Cisco Systems, ISR Technology, Mercury Computers Systems, Motorola, Inc., Factum Radioscape, Rockwell Collins, Inc., and Spectrum Signal Processing.